Witch Pricker is an installation that employs historic subject matter, sculptural objects and programmatic interface for visitor participation. 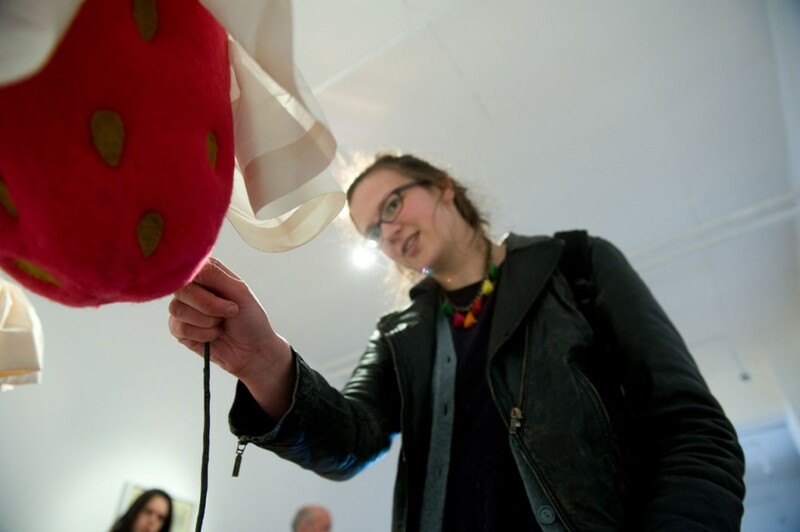 In this artwork, a series of hand-felted wool strawberries, draped with skirts, extends from a wall. 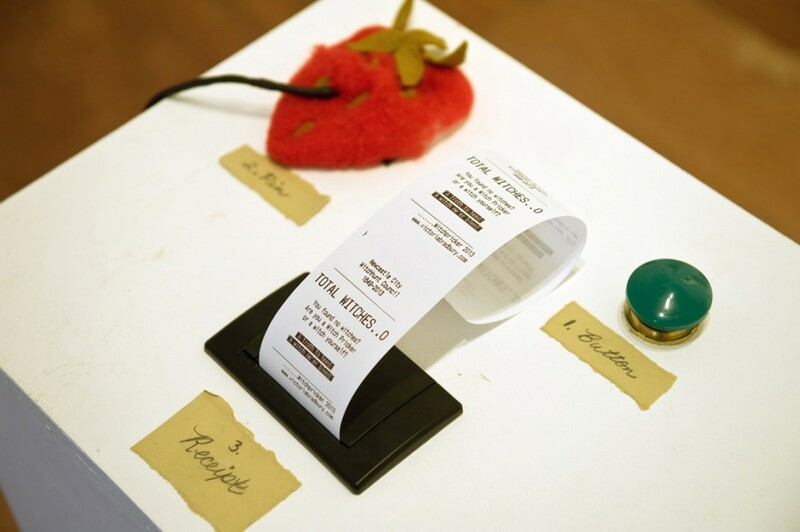 A push-button switch, a large sewing needle, and a receipt printer sit upon a central plinth. When a visitor steps forward and presses the button, a commanding voice is heard, stating, “Use the pin to prick each strawberry under her petticoat.” This triggers an invisible randomization within the program of each strawberry’s guilt or innocence. As the participant pricks each strawberry with the pin, a shriek is emitted if the accused is ‘innocent’. The sound of a gasping crowd plays if a ‘witch’ has been found. Meanwhile, the resolute voice proclaims each verdict as either, “She’s not a witch” or, “You have found a witch”. The number of ‘witches’ found is tallied by the artist-written C++ code. After the time is up and the buzzer sounds, a receipt is printed indicating the results. This receipt can then be taken to a gallery attendant and redeemed for a reward: a chocolate coin for each ‘witch’ found. 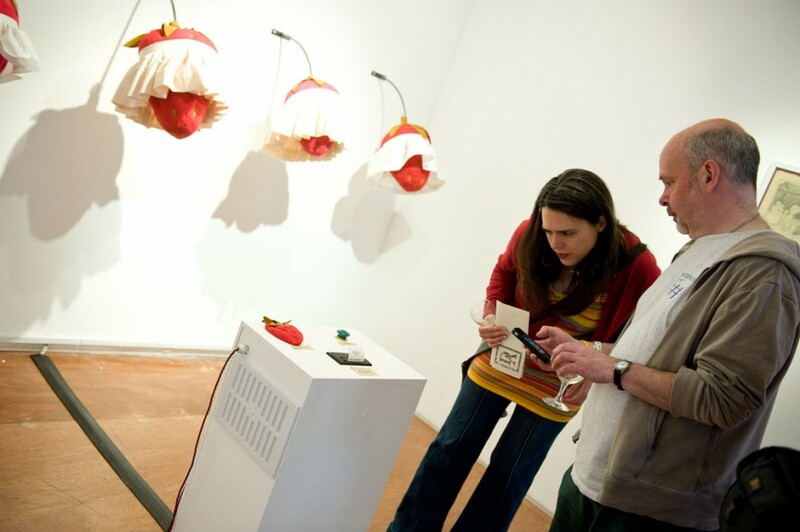 Victoria Bradbury @vbradbury is an artist weaving programming code, physical computing, body and object. She has recently led international art hacking events and workshops including The City is The City (is The City) at Baltan Labs (Eindhoven, Netherlands, 2015) and Thinking Digital Arts // Hack (Newcastle UK, 2014). She was a member of the British Council team for Hack the Space, Tate Modern. (London UK, 2014) and participated in the IMMERSION: Art and Technology workshops (Shanghai, China, 2012) and Digital Media Labs (Barrow, UK, 2014). Her work has been exhibited at Harvestworks, Hallwalls Gallery, and The New Britain Museum of American Art. Bradbury completed a practice-based PhD with CRUMB at the University of Sunderland, UK, in 2015.